“I am told he [Taylor] is employed by the Environment of Canada“? Yes dear, the environment of Canada has a huge payroll (doled out in buckets of berries and roots) and employs people who definitely should not belong to Andrew Derocher’s very own Polar Bear Specialist Group. There are a few nonsensical follow-ups but this is about as much traction as the comment gets from these folks who “heart” polar bears. See for yourself here. 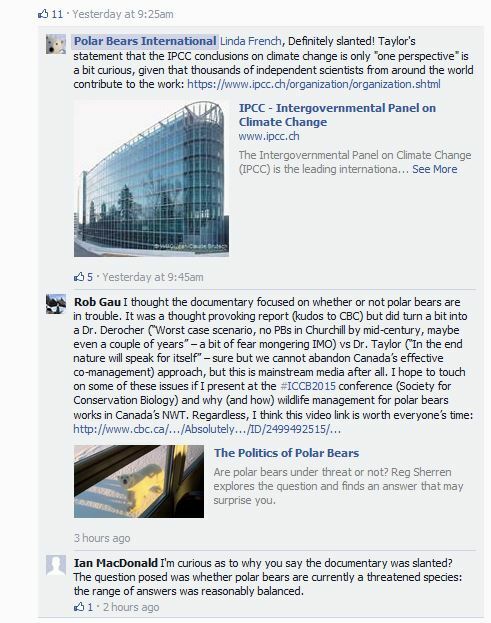 The entire documentary was about whether or not polar bears are actually in any kind of trouble at the moment — especially, whether the Western Hudson Bay population in particular has responded in any meaningful (biological) way to recent changes in sea ice — and all PBI has to say is that the IPCC calls itself an authority on climate change. And we are supposed to trust these people to educate children and teachers, and undertake unbiased scientific research? Seriously? 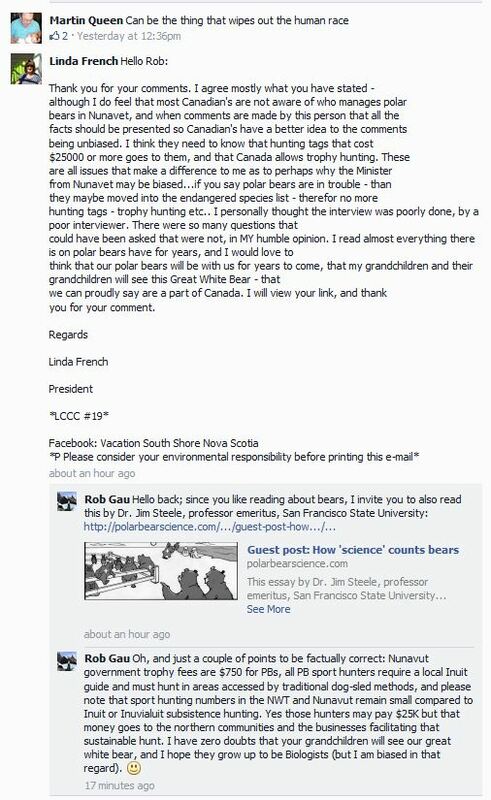 UPDATE 1: Northwest Territories biologist Rob Gau responded to PBI Facebook commenter Linda French earlier today (September 4) about the complaint of bias in the CBC documentary and had a bit of a conversation [commenter Ian MacDonald also thought the program was fairly balanced]. 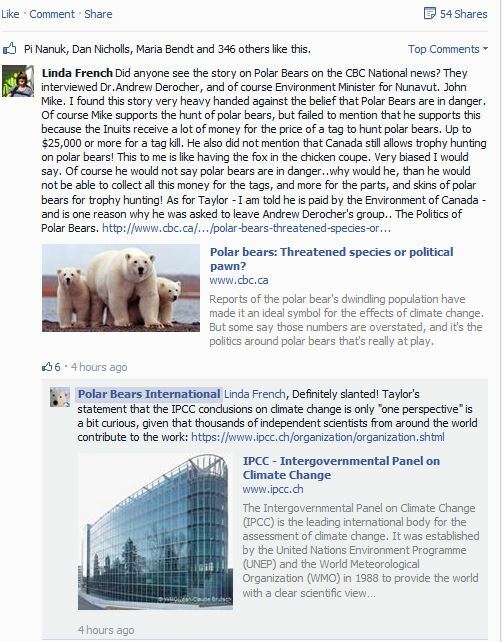 This entry was posted in Advocacy, Conservation Status, Sea ice habitat and tagged Derocher, documentary, endangered, Environment Canada, Facebook, IPCC, IUCN, logical fallacy, man behind the curtain, Polar Bear Specialist Group, polar bears, Polar Bears International, politics of polar bears, sport hunting, threatened, trophy bears. Bookmark the permalink.